Died 1272; cult confirmed in 1838; feast day formerly on March 13. Boniface was the son of Count Thomas of Savoy. He entered the Grande Chartreuse as a youth, became a Carthusian monk and then prior of Mantua. He served seven years as administrator of the diocese of Belley (1234-1241), before serving as bishop of Valence. 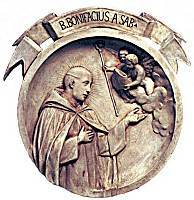 In 1241, Boniface was elected archbishop of Canterbury through the influence of his niece, Eleanor, wife of King Henry III of England, but did not enter his see until 1244. His appointment and attempts to reform the see were very unpopular. He tried to effect economies in the heavily debt-ridden see but was met with strenuous opposition, particularly from the suffragans of the various sees he attempted to visit. He excommunicated the bishop of London and the clergy of Saint Bartholomew's, and while an appeal to Rome upheld his visitation rights he was forced to rescind his excommunications, and his visitations had restrictions placed upon them. He acted as regent for Henry while the king was absent from the country, accompanied him on a diplomatic mission to France, and successfully negotiated a peaceful solution to difficulties over the succession in his native Savoy. He died en route to a crusade with Edward I at the castle of Sainte-Hélène des Millières in Savoy and was buried at Hautecombe.